… Signing yet ANOTHER perfectly aligned client. … Filling over HALF their spots for a photoshoot with weeks remaining. … Getting THREE new leads in their inbox in the same day. My inbox has been flooded with good news. And while I’m over here cheering them on (always! ), I’m also not surprised. Because I KNOW they’ve been doing the thought work to completely transform the way they show up in their life and business. Because to get those perfectly aligned clients, you first need to be clear on your message and your marketing. You need to shift the thoughts that you’re not good enough, that your industry is oversaturated, or that you’ll NEVER be able to make a living doing what you love. To get those spots filled you need to actually BELIEVE you can fill them. You need to fully commit to sharing your value, the results you’ll get your clients, and connect with them on a whole new level. Because flip-flopping your mindset on whether they’ll actually sell is a surefire way to make it harder to show up and almost guarantee that they don’t. Getting three new leads in your inbox is only possible when you commit to believing in YOURSELF, your business, and your offerings. AND show up accordingly. Because if YOU don’t even believe that what you’re offering is the most incredibly AMAZING thing, than why the hell would anyone else? And if you don't believe it… remind me again why you'd show up for it? Ladies, this is why mindset is so effing important. Because if your mindset isn’t in the right place, it becomes THAT much harder to get out of your own way and take the RIGHT actions to actually grow your business. And yet I see it time and time again on my free coaching calls that these stories can be incredibly hard to shift on your own and frankly, can keep you stuck and not bringing in revenue for weeks, months or even years. I’m all about offering value before you ever pay me a dime. So this week we’re talking about the five stories that are holding you back THE MOST from making sales (aka the five blind spots!) and how you can shift them NOW so you can get out of your own way and start making this business of yours work for YOU. In the beginning of the design business, I spent about a year and a half working on my website. I was so convinced that the “right” clients weren’t finding me because of it. It didn’t have the right look and feel. The copyrighting was off. I needed to hone in more on who I wanted to draw in. The list goes on. And while none of those things are inherently “bad” things to think about, it also wasn’t the real problem. Had I spent half as much time marketing my business as I did designing my website, I would have been booked out for months. I see it all the time in people who hop on my free Stressed to Success coaching calls. It feels so much safer to learn a new photography technique or to take another social media course rather than doing the mindset work to get real comfortable showing up for their audience and actually SELLING their offerings on a consistent basis. Because if there’s one thing that I’ve learned it’s that expertise alone does not equal a successful business. You could be the BEST at what you do, have the most amazing offering in the world, but if you don’t know how to market and sell it, your business will struggle. That’s why it’s so important shift those stories about what you REALLY need to make your business work. Now for you, maybe it’s a certification you feel like you need in order to do the work you’re feeling called to do (and consequently are already good at). Maybe it’s an email funnel you’re spending countless hours drafting because it feels safer than admitting you don’t have a clear message. Whatever it is, it may be time to take a deeper look at that thing you’re so convinced you NEED to move forward and ask yourself if it might be masking a mindset challenge instead. 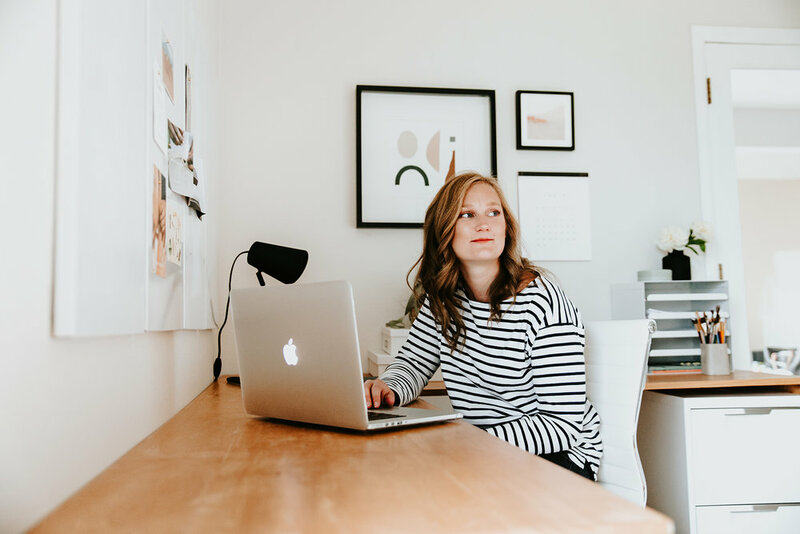 If you’re reading this, feeling like there’s definitely some money stories you need to sift through, then go ahead and download my money mindset journaling guide for business owners. I’m giving away one week of my most transformative journaling prompts so you can unearth your money stories and start making more it. This guide will bring up the exact thoughts you have around money that may be holding your back from charging your true value, getting more visible, closing more sales, and thriving in your business so you can shift them and start seeing more money in the bank! Because you get to choose what you believe, and it might be time to rewrite that money story so you can create a thriving life and business. And the same is true for mindset work as well. Simply KNOWING that you can use affirmations to uplevel your mindset isn’t the same as integrating them in your daily life. It’s the small, consistent efforts of reciting them or writing them out each day that uplevels your mindset bit by bit. That’s exactly why I help my clients couple this mindset work WITH the right actions that are going to bring them more of the results they want. And the same is true for you. If you’re feeling at a loss for what’s next for you in life or business, the worst thing you can do is stand still and wait for a grand epiphany. In one of my favorite books, Big Magic, by Elizabeth Gilbert, she talks about how inspiration finds you when you’re working and I couldn’t agree more. Don’t worry about being on the “right” or “perfect” path (because I don’t believe there is such a thing!). Start by taking small actions toward what it is you THINK you want and you’ll gain clarity from there. It’s easy to hide behind your own stories instead of doing the mindset work you need to step outside your comfort zone and take the actions you need to land more sales and create massive success in your life and business. Consequently, it’s that EXACT work that will move the needle more than any other strategy, certification, or online course you can throw into the mix. But I also know that it can be hard to see your own blind spots and exactly how you’re holding yourself back in life and business. If you’re looking for some strategic mindset coaching, personalized to you, sign up for my FREE Stressed to Success coaching call. During this 30-minute mindset and strategy session, I’ll help you uncover the mindset shift that will make the biggest difference for you, so you can start taking the RIGHT ACTIONS consistently and start saying “no” to the things that aren’t bringing in results. (Goodbye overwhelm! 👋) Because if you want wins like my clients are getting, I'm your girl! What’s one story about sales you told yourself in the past that you’ve decided to shift?